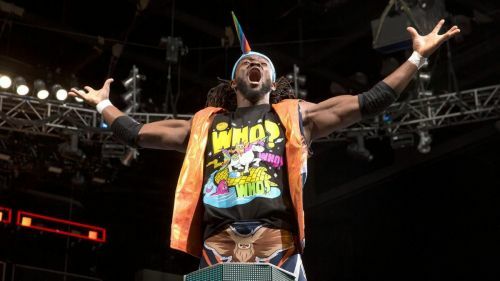 Kofi Kingston had a huge night on SmackDown. What if he follows that up with a career-changing victory at Elimination Chamber? Mustafa Ali was supposed to participate in this Sunday’s Elimination Chamber match for the WWE Championship. He had to step down due to injury and WWE made a shrewd choice in replacing him with Kofi Kingston. Kingston represents both an aerial artist capable of similar spots to Ali and a fan-friendly underdog. A week ago, no one would have seriously considered the prospect of Kingston in the WWE Championship picture. However, after a marathon run in the gauntlet match on SmackDown, which included pinning Daniel Bryan, Jeff Hardy, and Samoa Joe—well, it’s still hard to look at Kingston as any kind of favorite, but it seems possible WWE could offer him at least a short term push of a lifetime. How could Kingston win at Elimination Chamber and what would follow? This article takes a look at what this monster upset might mean in the match itself and for the months to follow on SmackDown. WWE may revisit AJ Styles vs. Kofi Kingston en route to Kingston's big win. Kofi Kingston’s gauntlet run on SmackDown told the story of a veteran giving it his all, and proving he belonged among the guys fans more readily accepted in the world title picture. His Cinderella Story came to an end when he hit AJ Styles, who not only made him tap out, but offered to let Kingston accept defeat and bow out without fighting, given he was clearly exhausted. It was a unique situation for Styles coming across as likeable for not wanting to beat up a guy who was already hurt, and for Kingston winning over fans all the more for his heart in refusing to accept defeat. If WWE were to go all the way in pushing Kingston to a world title reign, it would make sense to revisit this issue. Maybe Kingston would again be beaten down when Styles enters the chamber, or maybe the tables are turned and Styles would have already been in the match. Maybe the two would both start fresh as the first two men in the match. In any case, an organic story could follow based on what happened Tuesday night, and Kingston getting his fall back en route to a bigger victory.